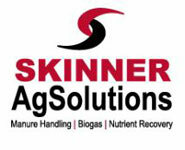 Skinner AgSolutions, Inc., a leader in the sale and distribution of agricultural waste management equipment, announced today that they will be co-sponsoring a BIOGAS SEMINAR entitled “New Technology Solutions for Biogas” at World Ag Expo in Tulare, CA on February 12-14, 2019. Other seminar co-sponsors and presenters will include Boerger, LLC; Hamilton Industries, Inc. and Industrial & Environmental Concepts, Inc. Dairy operators from the Western U.S. have been invited to attend, especially those with current biogas/digester facilities and those planning to add them in the near future. This one-hour seminar will be conducted in the Skinner AgSolutions, Inc. exhibitor’s tent at Booth #DS140 at 10:00 a.m. and 1:00 p.m. each day during World Ag Expo. Ron Skinner, President of Skinner AgSolutions, Inc. noted that, “We’re pleased to offer this information-packed, one-hour seminar to medium-sized and large dairies attending World Ag Expo. Along with our co-sponsors, we will be providing profit-making biogas innovations and ideas that the attendees can take home and put right into practice.” Skinner emphasized that the goal is to help dairy operators maximize gas output from their biogas facilities, thus maximizing their profits. Skinner AgSolutions is the exclusive distributor of Flygt-Xylem pumps, mixers and related equipment for the agricultural/biogas market. In addition, they are an authorized distributor of Godwin-Xylem, Goulds-Xylem, Boerger, Jash Valves, AL-2 Teknik, and Mapro equipment. They are also an authorized rental distributor of Godwin-Xylem pumps and related equipment for the agricultural/biogas market. Skinner AgSolutions uses these equipment resources to provide custom-engineered solutions for their agricultural customers in three key areas – manure handling, biogas and nutrient recovery.